Constructed in the Neolithic, the great passage tomb at Newgrange appears to have remained a place of spiritual importance long after it’s Stone Age builders had passed away. This is suggested by pair of gold Roman coins which were discovered at the the site. Probably representing votive offerings, they were deposited at the tomb sometime during the 4th century AD. They depict the Emperors Constantine I and Constantine II and were struck at the Roman mint in Trier, a city now located in modern Germany. The first coin bears the inscription CONSTANTINVS P F AVG and dates from AD 330-337, while the second coin is inscribed CONSTANTINVS IVN NOB C and dates from AD 320-330. They both contain small loops for suspension, which suggests that they had been reused as pendants. Valuable items, their deposition at Newgrange, beyond the western borders of the Roman Empire, is unlikely to represent a casual loss. The coins form part of a very important corpus of Roman material from the site. This collection of Roman artefacts includes at least 25 coins (Carson & Kelly, 1977) along with a number of rings, brooches and torc fragments. The majority of these object came from two specific locations; the area in front of the tomb entrance and the ground surrounding the three largest stones of the Great Stone Circle, which surrounds the monument. This apparent deliberate placement of precious objects at significant locations is suggestive of votive deposition. Whether they were buried here by native Irish worshipers or pilgrims from the Roman world, remains a mystery. 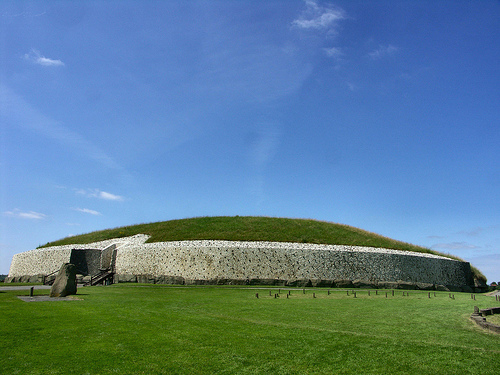 Similarly, the gods or goddesses venerated are unknown, although it may be significant that in later, medieval Irish texts, Newgrange is associated with the pre-Christian god, Dagda. Either way, the coins suggest that this great prehistoric monument was still viewed as a sacred place nearly 3,500 years after its construction. You mention the gold loop at the top of each coin, but what about those holes? Were those also used for threading a piece of leather through? They are so evocative when you consider that these may have been left there during the time that Christianity was co-exisiting with the earlier faith in Ireland. Just so interesting to think of the people who had cause to leave what must have been a precious treasure at the foot of a sacred place of a faith that was meeting and mixing with a new and likely strange new religion.